Made it during the xmax break! Amazing taste if made with proper ingredients such as fresh olive oil…You won’t believe what a difference even small ingredients such as olive oil can make!!! Thanks for the recipe! I made these last night. They were VERY easy and much less messy than I expected. My tip is to make them smaller than seems right because they do expand a little. Also, I hadn’t had Milano cookies in so long that I forgot how small they really are…a little smaller than a business card. Any tips for making them less crisp (besides dunking in soy milk)?? My favorite thing about Milanos is the softish crispness, and these had more crispy crispness. i think theyre called Veganos. (veeg*an*o*s) (not vegan*os) Or milan vegan (mispronouncing either milan or vegan so that it rhymes) but i think veganos is classier. I made these over the weekend and I got rave reviews about them. However, there were a couple of things I think were a bit off, even though they tasted really good. 1. I think I made them too big, therefore they were a tad more than “crisp” when they cooled. In fact, now that it’s a few days later, they’re actually downright hard. I’m wondering if it’s the size I made them or if it’s the cornstarch? 2. They’re a tad bit gritty. Otherwise, they’re excellent, not nearly as difficult or messy as I imagined and I’m DEFINITELY going to make them again. First the cupcake, now the milano, I have just one question. When are vegan doughnuts going to take over the world? I was always told chocolate chips are not vegan (because they have milk?) and to use carob chips instead because they work and taste just as good. Vegan aside they look yummy and I feel as though I should clean my pots and pans right now so I can make them and nibble before bed. man, was i excited *and i’m not even totally vegan* but, alas, as i was trying to exemplify my cooking prowess via these cookies…it was a total disaster. they were break-your-teeth hard… totally inedible beyond the first five minutes that they emerged from the oven. the taste was like fortune cookies and not sweet. i was more than disappointed as i had wasted my ingredients on a 1.5 batch. i am wondering if subbing some of the oil w/ applesauce or shortening might make them chewier or softer (read: edible). I made these for Easter. I didn’t use canola oil. I substituted coconut oil. When I mixed everything together the dough was a bit crumbly and I added a little more coconut oil. The cookies turned out hard, but still edible. My mom said they were good and she is not vegan. She said they weren’t as soft as the Pepperridge Farm Milano cookies. She did enjoy the orange taste to them. She microwaved one to make it softer. These were awesome! My very omnivorous dad enjoyed these as well, even though he said they weren’t as “flaky” as the originals. Personally, I loved them, especially after not having milanos since I went vegan (and loving it) about 5 months ago. I didn’t use the orange grating but didn’t miss it, and semisweet chocolate chips worked fine. My batch made 20, but next time I will probably make them smaller and thinner so they are more authentic in appearance. Mine only went hard after they had been in the fridge for 48 hours. I would recommend leaving them in for the initial hour and then leaving them at room temp, otherwise the chocolate solidifies back to its original state. great post! thanks for writing this. These aren’t vegan, right? Vegetarian means “no meat”, and vegan means “not eating anything that comes from an animal”, doesn’t it? No milk, no cheese, no butter, not even honey. This was my understanding of the definition of the term. Did I miss something, somewhere? These are delicious! I made these today and they rock! Those look great but i’m not so sure if they’d taste as good ;). I made these and these tasted AWESOME. But next time I’m making them thinner and smaller ’cause they are pretty hard to bite through. Will have to watch them in the oven closer to avoid burnt edges. Probably will also have the edges thicker. I put some peppermint extract in the chocolate and made mint veganos. I also experiemented with toasted coconut and pecans in the middle…so yummy I fooled my roommate who has a strong aversion to anything vegan. She LOVED them! I love this recipe!! I have tried out alot of vegan recipes over the years and I think i love this one!!! Is there anyway I can add it to my website? Could I substitute the canola oil for extra virgin olive oil? 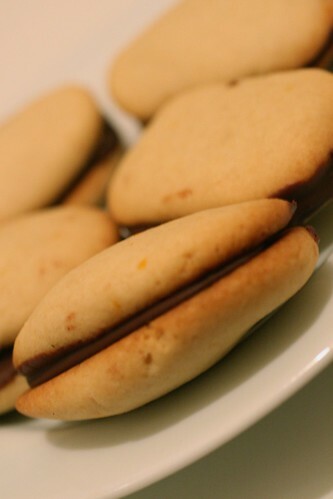 Very nice cookies, looks very delicious, I may try to bake some cookies tonight, it looks easy to made them. I fixed this last night for my husband and I. It turned out really great. I will definitely make this again. Thanks for sharing this recipe. Watch 24 Online For Free! I’ve been experimenting with some vegan recipes lately and I’ll have to admit, these came out pretty good. They were a bit crisp though. I’m not a big fan of crunchy foods but the kids and their friends absolutely loved them. I really enjoy what you write about here. I try and check your site every day so keep up the good work! Holy crud this looks good! I’m not vegan and I will be trying this! Bet Jodi over at popcookbook would go nuts for this to she is addicted to milanos. you know how you said orange zest pulls everything together, well do you htink that would work for some of my dishes like vegan muffins etc. that just fall apart because I am avoiding using egg (obviously) so you think orange zest could bind things together in the same way egg does for non-vegan baking? Goodness, these look amazing! Suddenly, my lunch is looking a little lackluster..
Great to see you looking out for the vegans. a lot of people forget to do this. I’ve been looking for a good vegan cookie recipe, thanks! Really cool pictures too. olive oil is very very tasty if you put it in fried foods and you can taste it raw too ,’. I will right away clutch your rss as I can’t in finding your e-mail subscription hyperlink or newsletter service. Do you’ve any? Kindly let me understand so that I may just subscribe. Thanks. Hi, i believe that i saw you visited my web site thus i came to ‘return the desire’.I’m trying to find issues to improve my website!I suppose its ok to make use of a few of your concepts!! You’re kinda amazing. Thank you for posting this recipe!!!! Keep posting stuff like this i really like it!!! If you’re currently looking for some interesting gifts for a little girl, this information will serve as your practical guide on the toys that little girls love to have. You can change 4 different games, you get lights and sounds and you can see 10 different alien faces on the LCD. It all sounds so appealing — often, so much better than it really is. you to various thoughts about this kind of matter using interesting and reliable content.